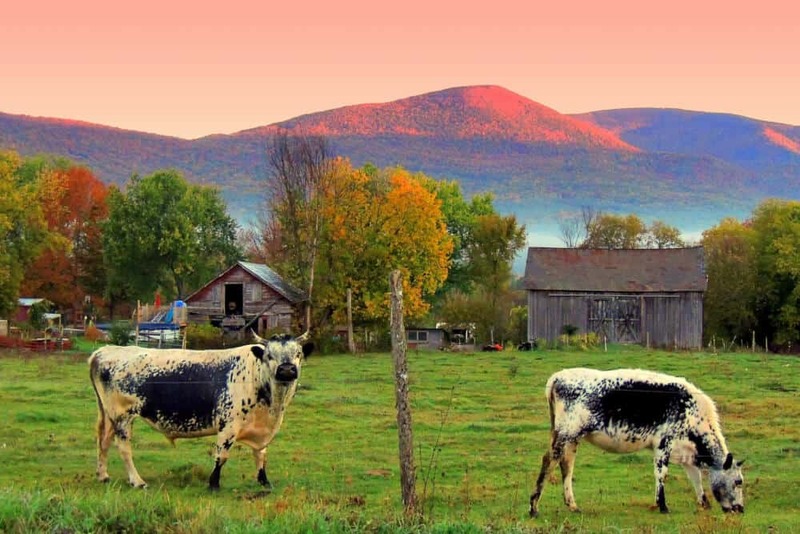 Ready to embark on a Vermont road trip you won’t soon forget? At 216.6 miles, Vermont’s longest state highway is also one of the most scenic and well-loved, meandering through the Green Mountains, as well as charming New England villages. 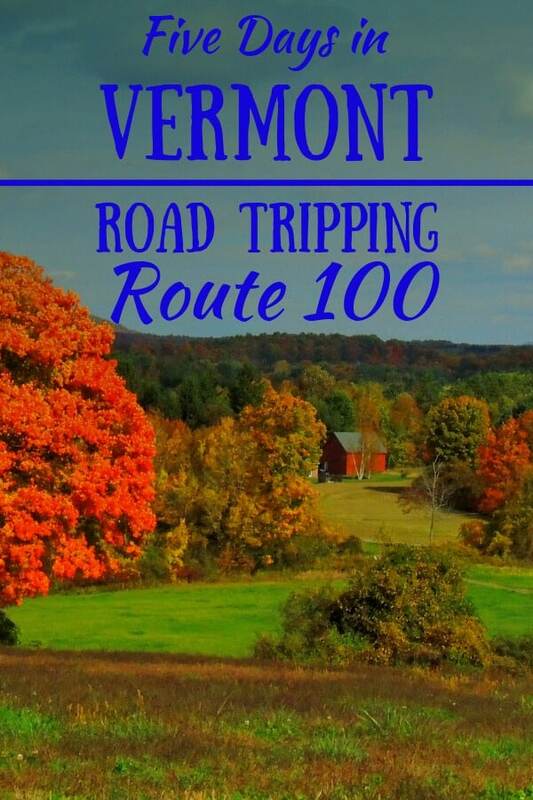 Route 100 runs straight through the center of Vermont, from north to south. Along the way, you’ll find a wealth of recreation opportunities, not to mention fabulous shopping, dining, and lodging. 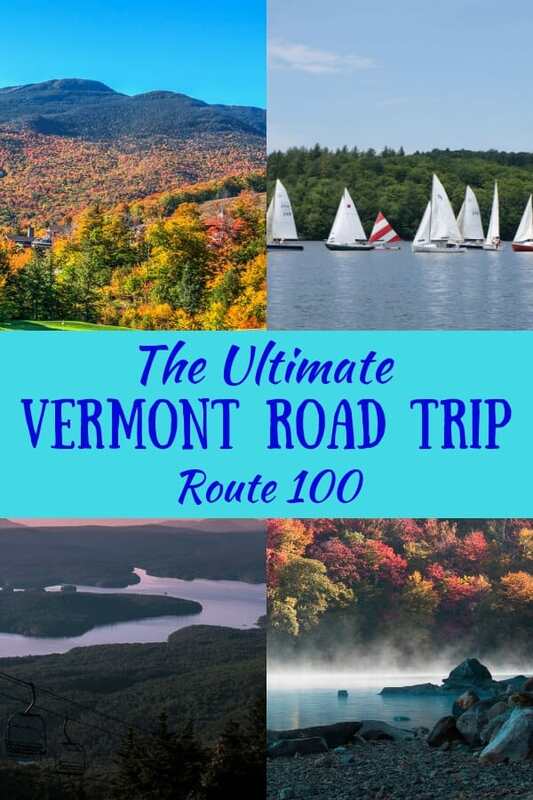 It’s no wonder Yankee Magazine named Vermont’s route 100 one of the best summer road trips in New England. If you’ve got five days to spend in the Green Mountains, then we have the perfect Vermont road trip itinerary for you. Explore all that route 100 has to offer, from pristine mountain lakes and secret swimming holes to magnificent vistas and quiet campgrounds. The Green Mountains are a little slice of heaven for outdoor lovers of every persuasion. We’ll start our journey in Southern Vermont, in the little town of Wilmington and head north to Newport, just south of the Canadian border. It’s no secret that Wilmington is one of my favorite Vermont towns, perhaps because the lakes and mountains are so accessible here. 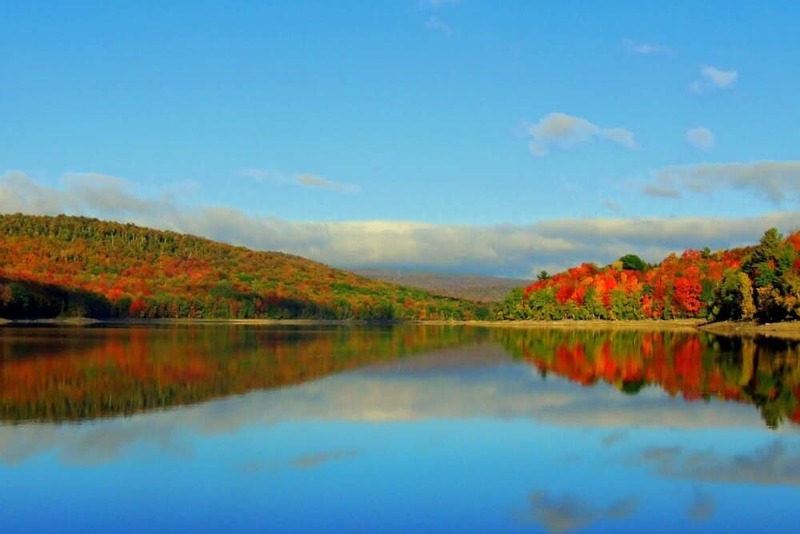 Just south of the village is the beautiful Lake Whitingham, also known as Harriman Reservoir. 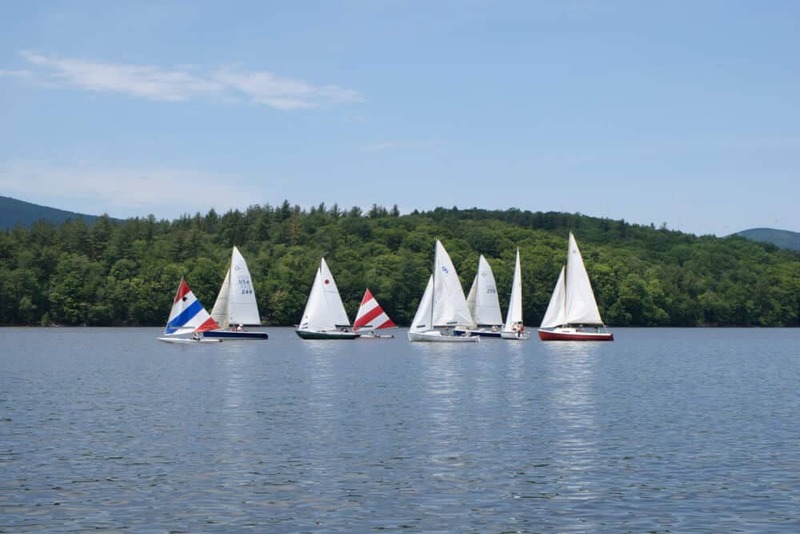 Covering more than 2,000 acres, Lake Whitingham is the largest lake in Southern Vermont. It’s the perfect place for swimming, sailing, paddling, and fishing, and yes, you’ll see a good number of cruisers, speedboats, and jet skis too. The beaches and picnic areas that surround the lake are free to use, and there’s even a clothing-optional zone, which is just a short hike from Ward’s Cove. The town itself is small, with only 2,000 full-time residents. You’ll find a lovely, walkable Main Street, plenty of restaurants, and great lodging options, from campgrounds and mom-and-pop motels, to luxury inns and resorts. Where to Eat: Locals love Dot’s Diner for a big, traditional breakfast, and we’d recommend Cask & Kiln Kitchen for upscale, eclectic dining and crafted cocktails. Where to stay: If you’re looking to pitch your tent, head a few miles east to Molly Stark State Park, where you’ll find a quiet, wooded campground with private sites and hot showers. Be sure to hike to the top of Mt. Olga (1.5-mile loop) for stunning views of the surrounding mountains. If roughing it isn’t your thing, we recommend checking into the Wilmington Inn, which is located right on Main Street and very close to the Valley Trail. A stay in this historic inn includes a full Vermont breakfast. This section of route 100 travels through the Green Mountain National Forest, and past Mount Snow Resort in West Dover. Mount Snow is open in all four seasons, offering world-class skiing and riding in the winter, and lift-serviced mountain biking in the summer. You can also ride the gondola to the top for fantastic views of Somerset Reservoir and the surrounding mountains. As you head north, you will go through the tiny town of Jamaica. There isn’t much to the town, but if your tummy is growling as you pass through, be sure to pop into Honeypie for a burger. 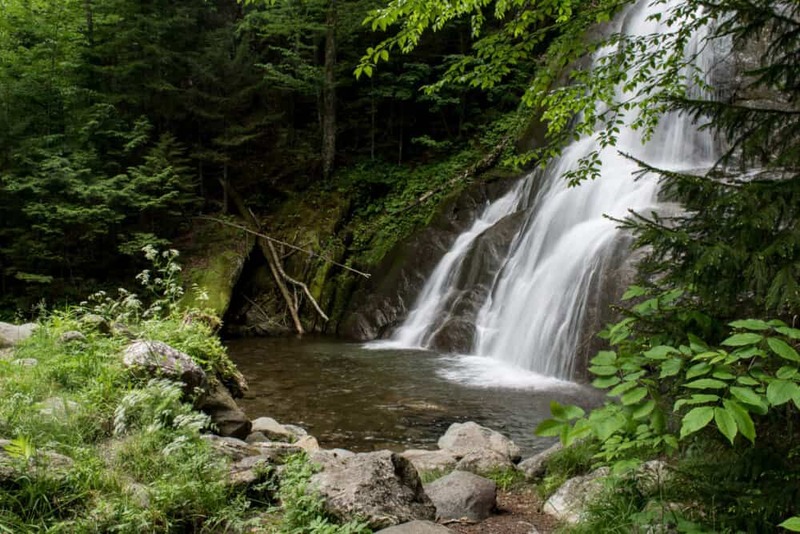 Jamaica State Park is located just outside the village and features awesome swimming in the West River, and a great hike to Hamilton Falls (6-miles round trip). Next stop, the Vermont Country Store in Weston. 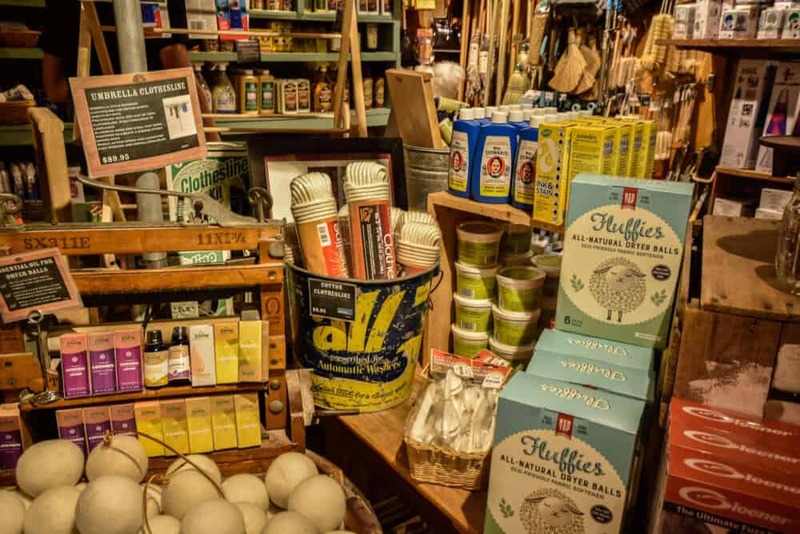 Located across from the village green on Main Street, the Vermont Country Store is a step back in time you won’t want to miss. The aisles are stocked to the rafters with penny candy, maple syrup, apothecary items, household goods, and lots of local goodies. Finally, make your way to Ludlow, Vermont, located in Okemo Valley and home to Okemo Mountain Resort. Ludlow is a small community, but you will find a few unique shopping and dining opportunities, as well as several trails and swimming holes. Buttermilk Falls is a popular swimming spot at the base of a lovely waterfall. Not to be missed on a hot summer day! Where to eat and sleep: For really unique dining and lodging, you have to check out Homestyle Hostel. The small, neighborhood restaurant serves up an eclectic mix of local dishes, all created fresh daily and beautifully prepared. Rooms are a mix of dorm-style, singles, and family-friendly suites, and all are beautifully decorated. Homestyle Hostel is nothing like hostels you may have stayed in during your youth. It is both welcoming and incredibly cozy, and a great place to connect with travelers from around the world. This section of route 100 is characterized by very small towns, mountainous terrain, and acres of farmland. For much of the drive, you will following the eastern slope of the Green Mountains, along the border of the Green Mountain National Forest. There are too many fun stops to mention, so I’m going to focus on my favorites. 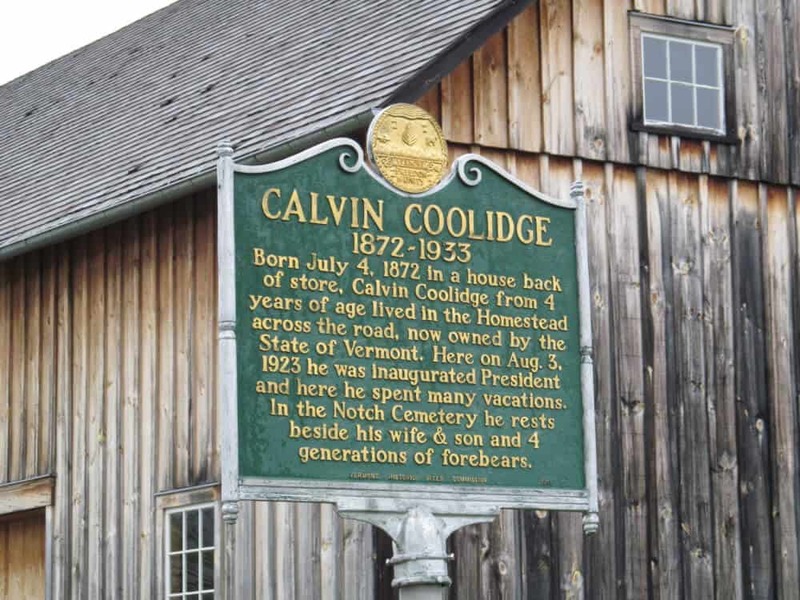 About 18 miles north of Ludlow, turn right on route 100A and drive a mile to President Calvin Coolidge State Historic Site. Plymouth Notch is the birthplace and boyhood home of our 30th president, and his homestead and the surrounding village are virtually unchanged since the 20th century. The village is known as the Plymouth Notch Historic District and is on the National Register of Historic Places. Meander around the 600 acres, visit the Calvin Coolidge Museum and Education Center and check out dozens of historically preserved buildings. After leaving Plymouth, continue north on 100A to the town of Bridgewater Corners, where you’ll find the famous Long Trail Brewing Company. This quaint riverside pub and restaurant is the perfect lunch spot, and the view is pretty great too! In addition to their popular Long Trail Ale, they make a variety of delicious seasonal craft beers. After your brewery stop, you will want to head west on route 4 to join back up with route 100 north. You’ll drive through the towns of Killington and Pittsfield while meandering along the White River. Just past Pittsfield is Tweed River Tubing, which is a great stop if you’re passing through in the summer. They provide tube rentals for floating down an awesome stretch of the White/Tweed Rivers, as well as a shuttle service to bring you back to your car. The river can get low in really dry spells, but if it’s high enough, it makes for a refreshing way to spend an afternoon. This beautiful waterfall is more of a roadside attraction than anything else, but it is one of the loveliest waterfalls in the state, so I urge you to stop for a little visit. Because Moss Glen Falls is located right off of route 100, it will only take a few minutes to check it out. Bring your camera! There’s no swimming at Moss Glen Falls, so if you’re passing through on a hot summer day, and you didn’t already embark on a tubing adventure, please continue north to Warren Falls for a little dip. After a long day of driving, swimming, and adventuring, it’s time to settle in at one of the first settled farms in the Mad River Valley. Lareau Farm Inn is a beautiful place to tuck in for the night, providing guests with beautiful, pet-friendly accommodations on a working farm. The bed and breakfast is surrounded by expansive meadows, quiet woods, and the Mad River. Right next door is the original American Flatbread Pizza — undoubtedly the best wood-fired pizza in the state of Vermont. Right across the road from Lareau Farm Inn is one of the most spectacular swimming holes in the state – Lareau Swimming Hole. Avoid visiting on hot summer weekends, but if you are passing through during the week, this place is a must-visit. While this section is short, it is packed with things to do! The Waterbury/Stowe area is fabulous in all four seasons, and if you’re feeling short on time, I urge you to give it an extra day. Here are some of our favorite tourist attractions and natural areas on route 100 between Waitsfield and Johnson. Waterbury is about 14 miles north of Waitsfield. 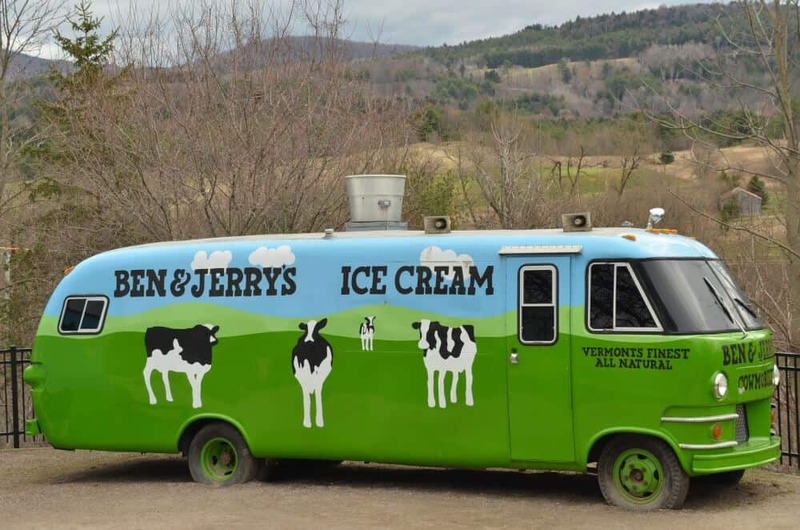 It is home to Ben & Jerry’s Factory Store, where guided tours are offered daily. Learn how Vermont’s famous ice cream is made, and be sure to stop at the flavor graveyard to pay your respects to the “dearly de-pinted”. 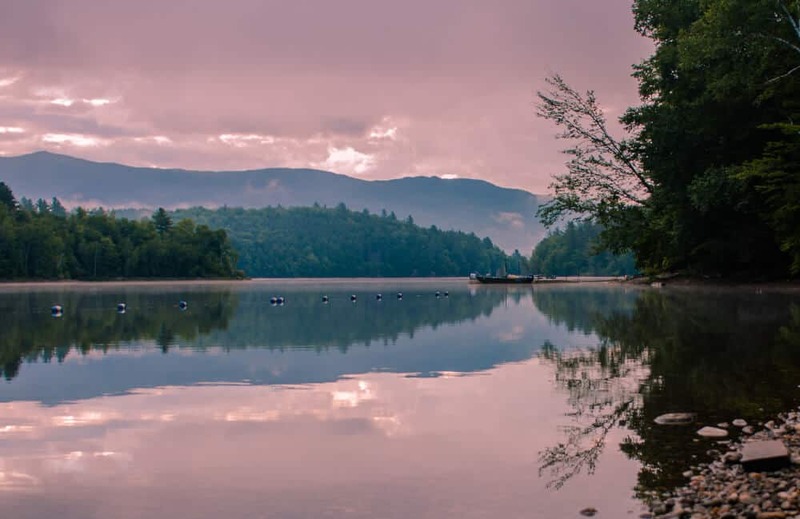 Waterbury Center State Park is located just off of route 100 and is one of our favorite spots for paddling, fishing, picnicking, and remote camping. The park is located on a 90-acre peninsula on the shores of Waterbury Reservoir. The reservoir was constructed by the CCC in the 1930s as a flood control project to protect the towns and villages along the Winooski River. The reservoir is surrounded by mountains, and a gorgeous spot to spend the day. There is front-country camping available on Waterbury Reservoir at Little River State Park, which is our top state park for kids in the whole state. Just a half mile from Waterbury Center State Park is Cold Hollow Cider Mill. Not only is this one of Vermont’s top tourist attractions, but they also have New England’s best cider donuts, in our opinion, anyway. Pop in for lunch or some fresh baked goods, and don’t forget a gallon of cider for your cooler! Stowe is home to Mt. Mansfield, Vermont’s highest mountain. There are several trails leading to the top, but if you don’t have time for an all-day hike, consider the auto toll road at Stowe Mountain Resort. The road takes you to the top of Mt. 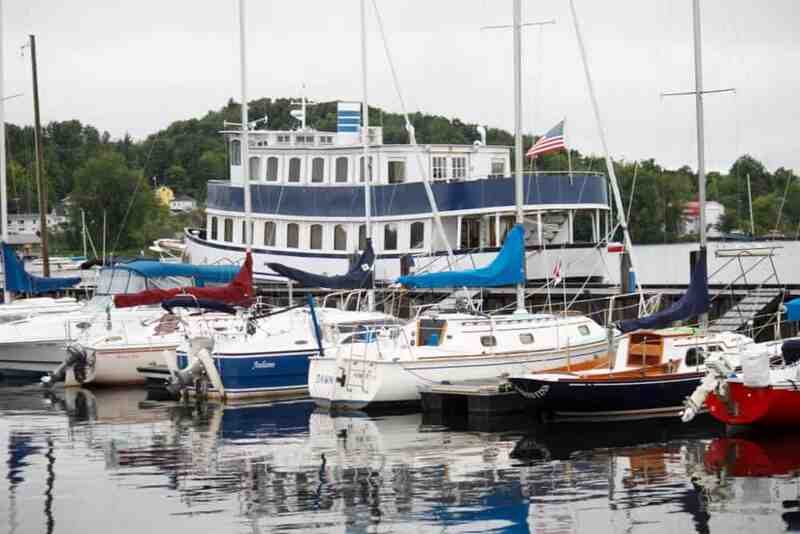 Mansfield (the nose), where you’ll have stunning views of Lake Champlain and the Adirondacks in New York. 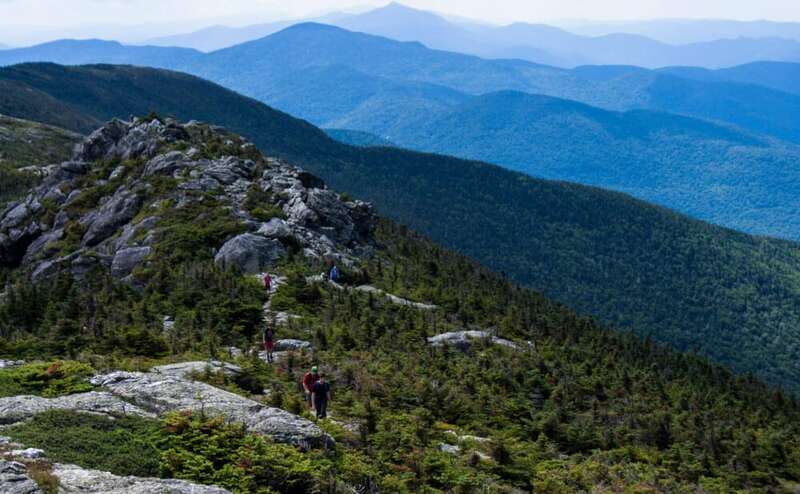 From the nose, you can hike along the ridge of the mountain to the chin (2.8 miles round trip), which is the highest point in Vermont at 4,395 feet. After your hike, be sure to stop at the Alchemist Brewery and Visitor Center to try out New England’s most famous beer, Heady Topper. The brewery and visitor center is located on Cottage Club Road in the village of Stowe. You will likely meet many fellow road trippers here — people come from near and far to stock up on the local brews. You are usually limited to 6 four packs of any variety. If you have time, consider a side trip through Smuggler’s Notch on route 108. This is a narrow pass through Mt. Mansfield and Spruce Peak, but not suitable for RVs. The roadside is flocked by huge boulders and dark caves, perfect for scrambling around. There are several trails along the roadside, including a lovely hike to Bingham Falls. The trail is an easy 1.6 miles round trip and brings you to one of the state’s most lovely waterfalls. After passing through “the Notch,” as it is affectionately called by the locals, retrace your steps back to route 100. From here, you will head north just a bit, to the tiny town of Morrisville. Here, you can choose from a handful of restaurants, from pizza and Chinese to eclectic comfort food. We love Moog’s, which is a relative newcomer, with a traditional menu and live music nightly. Where to stay: Just a few miles north of Morrisville in Hyde Park is the Fitch Hill Inn. This gorgeous farmhouse dates back to the 1700s and is so charming, you’ll want to move right in. There are six beautiful rooms to choose from, and homemade breakfast is included with your stay. Pets and children under eight are not permitted. The last stretch of your road trip is characterized by a wild stretch of road. As you head out of Hyde Park, be sure to take in the spectacular views of Mt. Mansfield behind you. You have entered the famous Northeast Kingdom, an area known for its wild and rugged beauty. The further north you go, the better your chances of seeing one of North America’s largest mammals, the massive moose. Be on the lookout for these gentle giants, especially along the roadside, where they pose a threat to unsuspecting motorists. You’ll pass through several small towns, including Eden, Lowell, Westfield, and Troy, before heading into the relative metropolis of Newport. Located on the shores of Lake Memphremagog, Newport is a bustling place these days. Main Street is lined with restaurants, boutiques, and galleries. Several waterfront overlooks allow you to take in the majestic views of the massive glacial lake, which covers 41 square miles. In the summer months, you can rent kayaks and bikes from the Great Outdoors to explore Newport’s natural beauty. Lake Memphremagog can be windy, so your best bet is to stick to South Bay, as well as the Black and Barton Rivers, which flow into it. The Newport Bebee Bike Path starts in the downtown area and runs for about six miles along the shore of the lake and into Canada (bring your passport if you choose to cross the border). Where to Eat: For casual waterfront dining, check out the Eastside Restaurant & Pub. If you’re looking for the best Thai and sushi in the Northeast Kingdom, you have to try Dusit Thai Cuisine. The owners relocated from Thailand in 2015, and have been wowing locals and visitors with their delicacies ever since. Where to Stay: There are a few motels and a bed and breakfast within the city limits, but we’ve had the best luck with the local Airbnbs. Choose from whole apartments, lakeside cottages, or simple guest rooms. If you haven’t tried Airbnb yet, you can save $40 using my referral code. Where to Camp: With 75 huge campsites for both tents and RVs, a swimming beach, and a playground area, Prouty Beach & Campground is a fun and inexpensive way to explore Newport and the surrounding communities. It’s a county park, right next to the bike path, and less than a mile from downtown Newport. After traveling through the mountains from south to north, you can easily hop on Interstate 91 in Newport, which will whisk you away to points south. 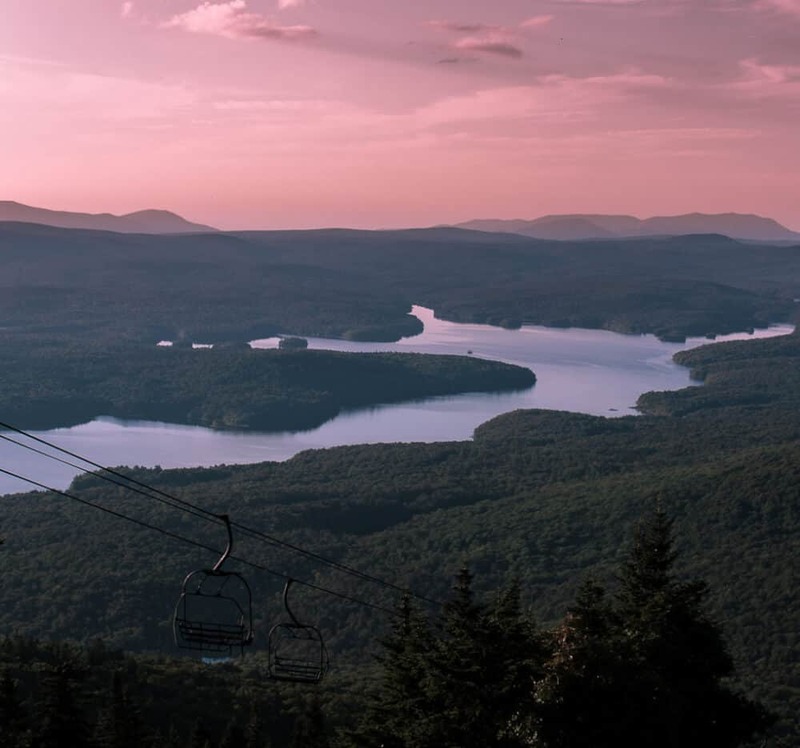 If you’re up for further adventures, you can head north into Canada (Montreal is two hours away), southwest into Burlington and the Champlain Valley, or south on the Connecticut River Byway. We’ve got a lot more travel ideas for New England and the Northeast, so feel free to look around. We’ve been traveling around Vermont for a pretty long time, but we’re always discovering new places to go and cool things to see. Here are the books, maps, and resources we used to plan this journey. Vermont Department of Tourism and Marketing – This is our one-stop shop for finding cool things to do throughout the state. Sign up for their mailing list or order a free vacation guide before your trip. 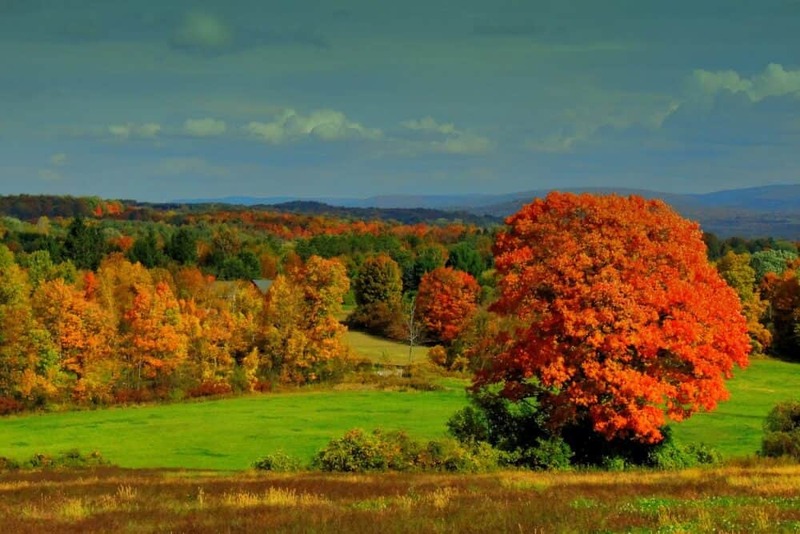 Discover Newport Vermont – Plan your stay in Newport and the surrounding communities. Accommodations – We love both small hotels and Airbnb apartments, depending on the trip. When booking a hotel room, we start by reading reviews and looking for deals on TripAdvisor. If are traveling with our family or need more space, we look for apartments or houses on Airbnb. We love The Dyrt for reading campground reviews. What’s your favorite Vermont road trip? Share it with our readers in the comments below. Vermont is beautiful. I’ve been to the Calvin Coolidge house as well as Ben & Jerry’s. I did not do your entire itinerary, but I love the stretch of 100 that I was on! Vermont looks like such a stunning area of the country to road trip in, especially in the autumn, the colours look incredible. I also imagine it to be such a peaceful region to explore too compared to other areas that have much higher rates of tourism. Unless you head to Vermont’s largest city, which is pretty small, you’ll find that things stay pretty quiet. It can be challenging if you’re looking for nightlife, but otherwise, it can be a welcome change from the chaos of many tourist areas. I love Vermont. We head there every year. It’s such a small state but it has so much packed into it. I feel like at every turn there’s something new and interesting. Oh and ice cream. So much good ice cream. When I was a kid and lived in Florida, we always headed north to Vermont in the summers. Best times of my life, and I agree with you about the ice cream! That view from Ward’s Cove is absolutely spectacular! I must admit, I’ve always been a summer girl, but it seems the older I get the more I’m drawn to those lovely autumn shades that I never had growing up in southern California. I know nothing of the northeast short of NYC, but Vermont has always been the state that’s most drawn me and your photos have definitely increased that. Love the sunset shot at Waterbury Reservoir and those falls are stunning. I love going on Road trips, and didn’t realize Vermont had such tall hills 😉 I live in Utah, so everything seems like hills to me, lol. I really loved the pink sunset over the lake, had to look at it a few times and might go look again to make it my desktop background. Didn’t know they had a road perfectly geared for roadtrips. This is a perfect five day itinerary. We’re in Canada but not far at all from Vermont yet we’ve never visited. Time to change that! Wards Cove in autumn is simply stunning!! What a timely post to read! We just drove Hwy 100 a few days ago! Great guide. I would add Cabots Creamery to the list in between Ben & Jerry’s and the cider place. They had tons of samples and fantastic cheese. This is the kind of trip I like doing – a combination of road trip, some hiking, waterscapes and mountains. I’m loving your nature photos, too. Goodness, how beautiful is Vermont! The cove and reservoir are absolutely gorgeous!! This calls for a family road trip! I have mapped out the Vermont 100 route before and it is always amazing. Of course I would stop for Ben and Jerry’s and some amazing craft beer. This is one of my favorite road trips I have never taken and loved your photographs, especially the fall color. Beautiful piece.